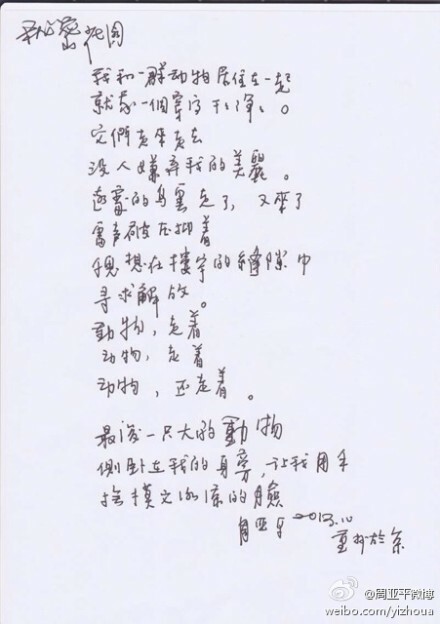 Recently, Zhou Yaping presents many of his poems under his own handwriting. What is shown here is his handwriting of the poem “Secret Garden.” Although Zhou Yaping writes colloquial verses and distances himself from any traditional or even conventionally modern styles of poetry, he writes many Chinese characters in the traditional forms 繁体. I’m not sure if this is because he was exposed to too many Taiwanese publications or because he was deeply embedded in the traditional culture making documentaries related to pre-modern Chinese history. When someone asked why he wrote traditional characters, he said frustratedly he couldn’t tell which characters were simplified and which ones were traditional. The handwritten poem brings the author closer to us and I think it looks nice. The following “Secret Garden” 秘密花园 is one of my favorite poems by Zhou Yaping. The translation is a cooperation of Me and Paul Manfredi. the only one dressed neat and tidy. No one to be disgusted with my beauty. The animals are still walking.